Remember Radio: To All Our Friends in Canada - "Happy Thanksgiving" - What is it? How did it start? 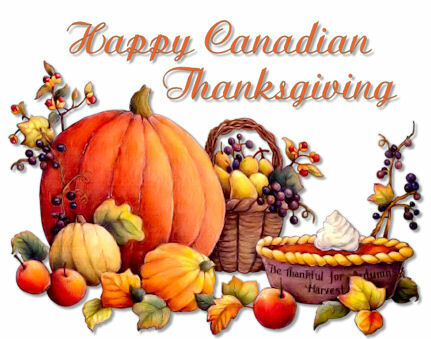 To All Our Friends in Canada - "Happy Thanksgiving" - What is it? How did it start? Thanksgiving (French: Action de grâce), or Thanksgiving Day (Jour de l'action de grâce) is an annual Canadian holiday, occurring on the second Monday in October, which celebrates the harvest and other blessings of the past year. Thanksgiving is a statutory holiday in most of Canada, with the exceptions being the Atlantic provinces of Prince Edward Island, Newfoundland and Labrador, New Brunswick, and Nova Scotia, where it is an optional holiday. Companies that are regulated by the federal government (such as those in the telecommunications and banking sectors) recognize the holiday regardless of its provincial status. While the actual Thanksgiving holiday is on a Monday, Canadians may gather for their Thanksgiving feast on any day during the long weekend. Foods traditionally served at Thanksgiving include roasted turkey, stuffing, mashed potatoes with gravy, sweet potatoes, cranberry sauce, sweet corn, various autumn vegetables (mainly various kinds of squashes but also Brussels sprouts), and pumpkin pie. Baked ham and apple pie are also fairly common, and various regional dishes and desserts may also be served, including salmon, wild game, butter tarts, and Nanaimo bars. In Canadian football, the Canadian Football League holds a nationally televised doubleheader, the Thanksgiving Day Classic. It is one of two weeks in which the league plays on Monday afternoons, the other being the Labour Day Classic. Unlike the Labour Day games, the teams that play on the Thanksgiving Day Classic vary each year; the Montreal Alouettes have traditionally held permanent hosting of the Thanksgiving games in recent years. According to some historians, the first celebration of Thanksgiving in North America occurred during the 1578 voyage of Martin Frobisher from England, in search of the Northwest Passage. His third voyage, to the Frobisher Bay area of Baffin Island in the present Canadian Territory of Nunavut, set out with the intention of starting a small settlement. His fleet of fifteen ships was outfitted with men, materials, and provisions. However, the loss of one of his ships through contact with ice, along with many of the building materials, was to prevent him from doing so. The expedition was plagued by ice and freak storms, which at times scattered the fleet; on meeting again at their anchorage in Frobisher Bay, "... Mayster Wolfall, a learned man, appointed by Her Majesty's Counsel to be their minister and preacher, made unto them a godly sermon, exhorting them especially to be thankful to God for their strange and miraculous deliverance in those so dangerous places ...". They celebrated Communion and "The celebration of divine mystery was the first sign, scale, and confirmation of Christ's name, death and passion ever known in all these quarters." (The notion of Frobisher's service being first on the continent has come into dispute, as Spaniards conducted similar services in Spanish North America during the mid-16th century, decades before Frobisher's arrival. Lower Canada and Upper Canada observed Thanksgiving on different dates; for example, in 1816 both celebrated Thanksgiving for the termination of the war of 1812 between France, the U.S. and Great Britain, with Lower Canada marking the day on May 21 and Upper Canada on June 18. In 1838, Lower Canada used Thanksgiving to celebrate the end of the Lower Canada Rebellion. Following the rebellions, the two Canadas were merged into a united Province of Canada, which observed Thanksgiving six times from 1850 to 1865. During this period, Thanksgiving was a solemn, mid-week celebration.